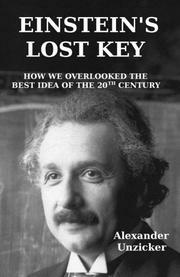 A physicist argues for one of Albert Einstein’s abandoned ideas in this defense of a road less traveled. Unzicker’s (The Higgs Fake, 2013) stated primary thesis is to examine a concept that Einstein originally incorporated into his work on relativity, but later abandoned: a variable speed of light. The author argues that if one considers it as a variable, rather than a constant, the role of gravity in modeling the universe becomes a much simpler one. To support his arguments, Unzicker offers alternative explanations for several phenomena that have been used to bolster Einstein’s theory, such as English physicist Arthur Eddington’s famous observations of gravitational lensing. He also works to explain his ideas in simple, clear language. However, these efforts eventually lead the author to what appears to be his actual thesis: his dissatisfaction with the current state of modern physics and its focus on mathematical abstractions instead of visually comprehensible ideas. Einstein famously used easily diagrammed train simulations to picture and explain his theories, and Unzicker asserts that this mode of thinking is missing from modern physics, to its detriment. Overall, the author’s ideas are engaging and he presents them well. Although he doesn’t make a compelling argument for the correctness of a variable light-speed, he does succeed in framing his questions and explaining his reasoning in clear, relatively simple terms. However, his insistence on attacking the “groupthink” of the scientific community and his criticism of mathematical models over more intuitive practices becomes overly insistent. It detracts from the inherent appeal of the underlying concepts and turns an examination of one of Einstein’s unheralded ideas into a screed against the scientific establishment. A passionate but disconnected treatise whose adversarial tone makes for an ultimately unpleasant reading experience.